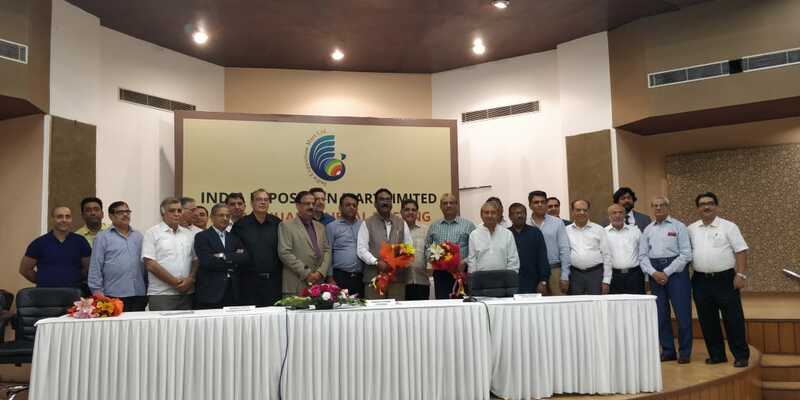 New Delhi – September, 27, 2018 – 17TH Annual General Meeting of the India Exposition Mart Ltd. held at New Delhi today. The members from all over the Country were present in the meeting. Mr. Rakesh Kumar, Chairman-IEML while addressing the AGM, informed that Rs. 100 crores turnover has been crossed as record turnover for the financial year 2017-18. He also mentioned about various services added in the mart area and many more are being planned. Some of the world renowned fair and events held at expo mart were 14th edition of Auto Expo,44th & 45th IHGF Delhi Fair,13th ELECRAMA, 3rd edition of Global Exhibition on Services-GES 2017,200th India International Mega Trade Fair(IIMTF), Indus Food Exhibition-2018(RBSM), 2nd Exhibition Excellence Awards -2017, the 19th Organic World Congress and 18th World Road IRF Meeting 2017, which kept our venue occupied for almost 150 days. India Exposition Mart Ltd. will soon have a connectivity with metro and Jewar airport has also been announced by the Government of U.P. This will provide relief to mart owner and commuters visiting expo mart and trade fairs at the venue. The company has installed 3MW solar roof top making exp mart as the first with the highest installed solar power amongst the various exhibition venues.